Cover of a Hitachi Company brochure promoting the Inuyama Rhine Park Monorail inaugurated in March 1962 (operation of this line ended in December 2008 after 46 years of service). Copyright The Hitachi Company of Japan. Image Source: unless otherwise noted Hitachi descriptive and promotional material from 1960 - 1970; Collection Reinhard Krischer. Use of the material courtesy of the Hitachi Company of Japan. Image Copyright The Hitachi Company of Japan. Text of this website Copyright Reinhard Krischer. Hitachi, Ltd. of Japan, founded in 1910, has always been one of the worlds leading innovators of technology in many sectors of industry. Since 1926, when the Japanese National Railways began its electrification program, the company is also its countrys leading manufacturer of railway locomotives, rolling stock and equipment. 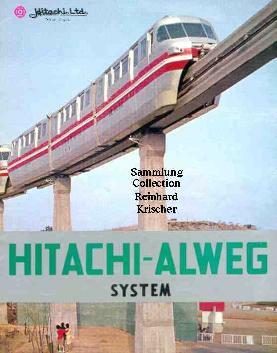 Hitachi, always on the lookout for new developments and itsself active in monorail research, created in 1960 in cooperation with the Alweg Company (through acquisition of patent licenses) its HITACHI-ALWEG division. In its well made brochures Hitachi-Alweg introduced its monorail system by relating very candidly the story of the development of the original Alweg Monorail, illustrating this history with photos from Alwegs Cologne-Fuehlingen test facility. 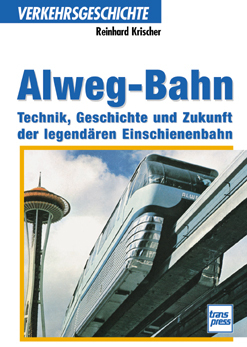 Later brochures include also photos of Alwegs Seattle monorail. Hitachi monorail train of the Yomiuri-land Recreation Park, 1963/1964. Copyright The Hitachi Company of Japan. Then in 1963 and 1964 a monorail line was built for the Yomiuri-land Recreation Park. Traversing beautiful scenery with breathtaking views of Tokyo the line, built to also serve skiing areas and golf links in the park, includes two spectacular monorail girder bridges and some steeply graded line sections. When Tokyo was chosen as the site of the 18th Olympic Summer Games to be held in 1964 it was decided to connect downtown Tokyo and Tokyo International Airport at Haneda with a 13.1km long Hitachi-Alweg monorail line. After just 16 months of construction time this line the Haneda Monorail Line was opened on September 17, 1964, and it is still in service today. The Haneda line became a genuine Alweg technology showcase and includes most every conceivable situation that had originally been envisioned by the Alweg pioneers in Cologne: the five-story high downtown terminal, part of the Hamamatsu-cho Japanese National Railway station, with the monorail teminal situated on the fifth floor; a two-story underground terminal at Haneda Airport; a long stretch of line running over water with a station over the sea; two tunnels (one under the Ebitori River); bridges; concrete and steel track beams; switches; train shed and inspection shop; power facilities; automatic block signalling; even two monorail inspection and maintenance locomotives powered by internal combustion engines. Classic Hitachi portrait of a monorail train on the Haneda Line, inaugurated in 1964. Copyright The Hitachi Company of Japan. 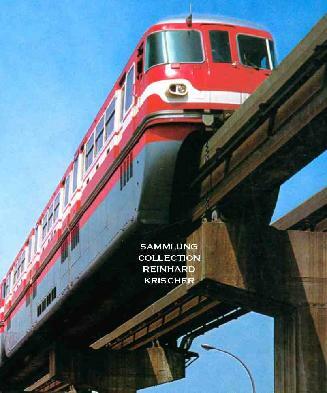 One of the 1964 Hitachi-Alweg brochures about the Haneda Line includes a photograph that shows a monorail train gliding over a bridge that crosses the tracks of the Japanese National Railway. Over one of the JNR tracks travels one of the then still very new and revolutionary Hitachi high speed Tokaido trains. For the monorail this an ominous picture because it very clearly illustrates that the Haneda Line, ingenious as it may be, is one of those special situation lines where monorail offers the most practical solution. What makes this scene still more interesting is that it shows that a huge company like Hitachi could afford to build both: Tokaido supertrains and Hitachi-Alweg monorails. This was in the year 1964. The original Alweg Company had then already come ever closer to the end of its line. Alweg Cologne was under the aegis of Krupp and its American subsidiary Wegematic was in the hands of the executors of Dr. Wenner-Grens estate. Regular salary payments to the Alweg men in Seattle had already ceased during 1963. One of the Hitachi monorail trains built for the 1970 Osaka Expo. Copyright The Hitachi Company of Japan. Alweg had nevertheless set monorail standards with its line for the 1962 Worlds Fair in Seattle. The famous Haneda Line still followed those standards, but these were updated with Japanese technology in 1970 on the 4.3km long monorail line built during the period from December 3, 1968 to March 11, 1970 on the huge grounds designated for the 1970 Worlds Fair in Osaka (Source: technical brochue Expo Monorail). This exhibition opened on March 15, 1970 and is by the way to this day with 64 million visitors the most successful Worlds Fair ever and its full-scale Expo Monorail proved once again the practical versatility of monorail transport. In 1967 the Japanese Ministry of Transportation adopted standards developed by the Japanese Monorail Association. Since then the drive units, the classic monorail bogies, are arranged completely below the floor-line of the cars and no longer protrude into the interior of the cars, thus eliminating the classic Alweg wheel case (bogey casing). The later (after Osaka) large Hitachi monorail trains took on a taller and boxier silhouette than the original Alweg design. The from then on flat car floors allow a greater passenger capacity and flow. The Hitachi Company's most modern trains today again display a very pleasing design without any "boxiness". Interior view of one of Hitachi's Osaka Expo '70 monorail trains. It shows that the Hitachi engineers had now placed the bogies (the drive units) completely underneath the floors of the monorail cars, - making the Alweg walk-through principle come true without "bogey casings" protruding into the passenger compartments. Copyright The Hitachi Company of Japan. 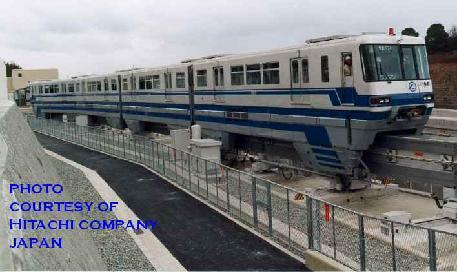 The Osaka Expo trains (six trains, each consisting of four permanently coupled cars) were already built to this new standard. When the trains were put onto the line, the bogies were individually placed onto the beam and after that the car bodies were mounted onto the bogies. 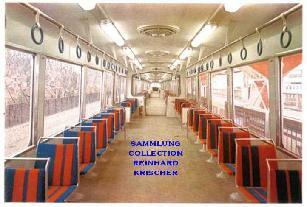 It is said that placement of the bogies underneath the floorline has improved upon the ride comfort as compared to the rigid original Alweg design. What made the Osaka Expo trains particularly distinctive were the large windows, particularly on the head ends of the units. The line was equipped with automatic train control (as used on the Haneda line) and built with seven stations, switches, a car and repair shed and train washing facilities. 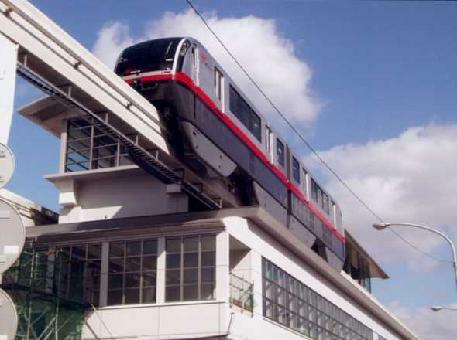 Modern Hitachi monorail train of the Naha Line on Okinawa in 2003. Photo courtesy of and Copyright The Hitachi Company. In Seattle Alweg engineer Rolf Krischer had been offered a position by Hitachi in Japan. It was for him a difficult decision to make. He was already 52 years old and the decision to immigrate with his family to the United States and to place all hope for a bright future on the success of Alweg had for him been a big enough gamble. So he decided to stay with Alweg in Seattle. Had he known what was soon to ensue, he might have decided differently. Hitachi monorail train of the Kita-Kyushu line inaugurated in 1985. Copyright The Hitachi Company of Japan. 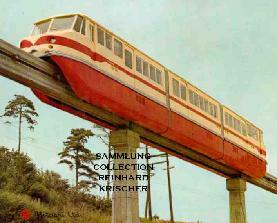 For a complete history of the Alweg Monorail Company (including a history of monorails in general) in Germany and the USA (and of course about Hitachi-Alweg) see the richly illustrated German book ALWEG-BAHN by Reinhard Krischer (the author of this ALWEG ARCHIVES website). The book also describes and illustrates Alweg's role in transportation history, showing that the Alweg concept is - despite experts' opinions to the contrary - still very much alive and retains, thanks to its timeless modernity, a very bright future ! As shown today by the numerous Hitachi-built monorails and the Las Vegas Monorail by Bombardier. Click bookcover for more details ! F�r die Inhalte der Websites/Webseiten, zu denen Links von The Alweg Archives aus f�hren, wird keine Verantwortung �bernommen.